Exclusive US library/school hardback edition. This is Mary Shelley's classic story as a full-color graphic novel. Library-bound to withstand the rigors of school and library use. 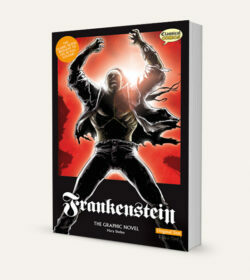 Lexile® measure GN850L Conceived as part of a literary game among friends in 1816, Frankenstein is today regarded as a classic piece of 19th century literature. This version, though slightly abridged, retains much of the original dialogue and remains true to Shelley's brilliant vision….